TL; DR: Replicon pioneered the web-based application space 20 years ago with its time management software that helps businesses optimize approaches to time capture, billing, and payroll. Today, the company is still at it, providing SaaS solutions that boost efficiencies and improves the bottom lines of thousands of businesses worldwide. Replicon’s software gives organizations a single, flexible solution that can be distributed throughout the enterprise to address pain points associated with manual time capture and deployment agility when onboarding new teams. Ultimately, businesses want high returns on their investments, and Replicon delivers. The team at Logic Healthcare is charged with helping hospitals streamline their IT environments so healthcare professionals can focus on their central mission of caring for patients. Logic’s job is important — it’s also a big one. The company’s consultants spend seemingly endless hours on the road traveling across 21 states to serve their clients. With these long commutes, it’s no wonder Logic viewed time as one of its most valuable assets. The company didn’t want its employees to spend lengthy periods manually tracking time and expenses but quickly found its legacy systems required employees to do just that. That’s when Logic turned to Replicon. By implementing Replicon’s time management software, Logic was able to house its time and expense information in one place, which provided full visibility into the company’s resources and bottom line. Employees in the field no longer had to perform manual data entry for their time and travel expenses. Rather, the process was automated through Replicon’s intuitive mobile app. And, with integrations with QuickBooks, Replicon made billing a breeze. Scott Bales, VP of Solution Engineering, told us how Replicon helps businesses optimize time and payroll management. For Scott Bales, Replicon’s VP of Solution Engineering, Logic’s story represents just another day at the office. Scott has seen Replicon help thousands of companies, like Logic, optimize operations and run more efficiently. For more than 20 years, Replicon’s flexible tools have been giving businesses real-time visibility into their time management, billing, and payroll processes. These businesses turn to Replicon because the company’s solutions are effective and present an immediate return on investment. In 1996, Raj Narayanaswamy and Lakshmi Raj found themselves in the tech field doing contract work in software development. The husband and wife team noticed a big gap in the tools available at the time to accurately capture time and bill their clients. They knew they were leaving unbilled time and, therefore, revenue on the table and wanted to create a solution. Scott told us the software application market 20 years ago was exclusively client-install. There were no web-based products on the market, and Raj and Lakshmi changed that. Lakshmi Raj and Raj Narayanaswamy founded Replicon as a better way to capture and manage time and billing. According to Scott, the big challenge early on was to educate the market. Businesses were used to installing products, not accessing them like webpages. The market eventually caught up after Replicon pioneered the web-based application space, and the company experienced tremendous growth. But, like any innovator, Replicon knew it was time for a change in 2005 when the industry was moving away from selling on-premises local installations and flying into the cloud. With this move, Scott told us the product is more scalable, secured through redundancies, and available globally. What makes Replicon such an effective tool is that it’s a comprehensive solution. Businesses can manage and measure all the essential aspects of human resources, including remote workforce engagement, employee time and absences, and efficiency, among others. 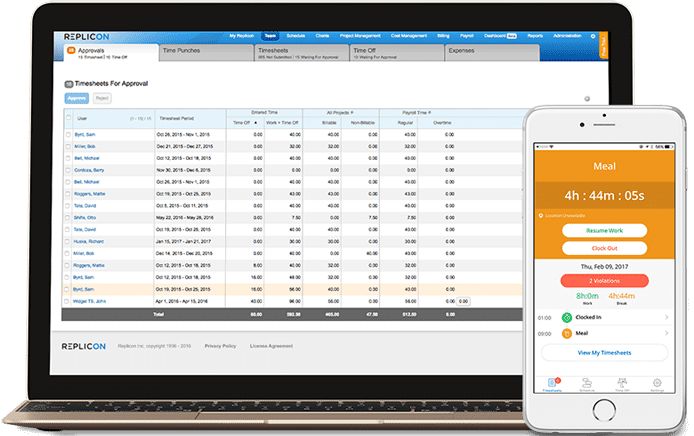 In addition, the tool provides a central location that allows for accurate billing, measurement of labor costs, and vendor management. Replicon’s solution also ensures businesses remain compliant with labor laws and grants complete control over payroll processes. Once onboard, Replicon’s customers find that the flexibility of the solution allows for deployment across the entire enterprise. Because different business units within an organization require different solutions, companies have found themselves purchasing an array of disparate tools. But the of flexibility Replicon’s product means it can be used by widely varying teams. Removing the need for manual data entry is probably one of the biggest advantages Replicon provides. According to Scott, this is the main friction point that brings customers to Replicon. Whether it’s capturing time to pay employees or billing clients, Scott told us manual time and billing tracking is scaring businesses because of all the things that can go wrong. The other main factor driving businesses to Replicon is speed of deployment. Scott told us companies that have recently gone through a major round of hiring face the challenge of immediately capturing time for new employees. These businesses come to Replicon because they aren’t able to onboard all the new hires into their system as rapidly as they’d like, but they still need to capture time for payroll. The speed and agility at which Replicon works alleviates this pain point. Replicon removes long deployment cycles, so businesses can be up and running within hours instead of months. According to Scott, it’s this underlying business layer that gives him the edge when he’s in the room with the competition. This allows Replicon’s customers to get up and running quickly and presents an almost instantaneous view of the high return on investment the product provides. As did Logic Healthcare, thousands of companies have found Replicon’s management software an effective tool to eliminate time-consuming manual data entry. Automating billing, time capture, and payroll processes with agility allows businesses to optimize operations and bring bottom lines into focus. Always the innovators, Replicon doesn’t show any signs of slowing its efforts to help businesses run more efficiently. Scott told us many multinational companies are often faced with outsourcing payroll to expensive third-party vendors. By listening to customer needs, Replicon was able to understand the difficulty some businesses have in assessing the value of service providers. Companies lack the flexibility to swap payroll vendors in different locales because cost comparisons aren’t available.